We are immensely proud of our flagship project at Ashing Lane near Dunholme in Lincolnshire. A great diversity of flora and fauna can be seen on the reserve throughout the year. We get regular updates about birdlife and increasing numbers of reports about moths, butterflies, dragonflies. There are resident amphibians and small mammals and even sightings of roe deer on site. NWT were involved in the planting of PC Wood in the grounds of the Lincolnshire Police Headquarters at Nettleham. 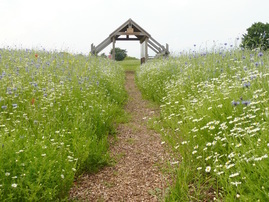 The major part of the wood was completed as a community-wide planting day in February 2008. It is now maturing beautifully and is enjoyed daily by many people. The Parish Council in Nettleham has opened up the site of the Bishop's Palace, an ancient monument dating from the 12th century. As part of the work, an area of apple and native species trees and wildflowers has been planted and named Bishops Meadow. NWT members participated in the tree planting with other members of the community.